Professor Andrew Hussey is a native of Liverpool and studied at the universities of Manchester and Lyon III. He started his career as a journalist writing for Julie Burchill's Modern Review and since has written for every major British newspaper as well as the TLS the LRB and the Literary Review. These days he writes mainly for the New Statesman and the Guardian/Observer. Professor Hussey began his academic career with an MPhil on Louis Ferdinand Céline and then a PhD on Georges Bataille. He has written on Guy Debord the Lettristes, William Burroughs and North African writing. Professor Hussey's biography of Guy Debord was chosen by Julian Barnes as 'International Book of the Year' in the Times Literary Supplement 2001. His book on Paris was described by Peter Ackroyd as 'masterly' and as 'a magnificent achievement' by the New York Times. In France, this book was shortlisted for the Prix Grandgousier and has been praised in the pages of Le Monde des Livres, Le Nouvel Observateur and L'Humanité as well as being chosen as a book of the week by Jacques Munier on France-Culture. Professor Hussey is currently writing a book called 'The French Intifada: The Long War Between France and its Arabs' to be published in 2013 by Granta UK, Faber USA and La Martinière France. He also makes documentaries for television and radio including the widely acclaimed 'France on a Plate' first shown on BBC4 in 2011. He was awarded an OBE in 2011 for services to Anglo-French cultural relations. 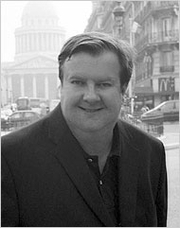 Andrew Hussey is currently considered a "single author." If one or more works are by a distinct, homonymous authors, go ahead and split the author. Andrew Hussey is composed of 3 names. You can examine and separate out names.